We got a very good review in Dagbladet (leading newspaper in Norway) today, and 5 out of six stars. ALBUM : " There is every reason to want this quartet welcomed into the warmth of the Norwegian jazz scene. Here there is more to come ," wrote colleague Fredrik Wandrup here in the newspaper when he reviewed Hanna Paulsberg Concepts debut album" Waltz for Lilli » autumn 2012. 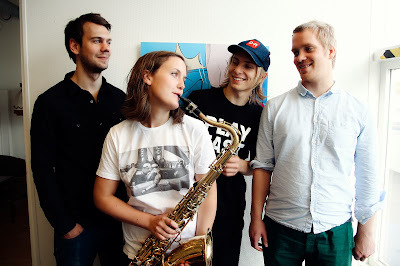 Now "more" here in the form of the album " Song for Josia " and from the first bars it lets us know that Hanna Paulsberg ( tenor sax ) , Oscar Grönberg (piano ) , Trygve Waldemar Fiske ( bass) and Hans Hulbækmo (drums ) has grown even stronger, both as individual musicians and as a band. Still swinging, firmly rooted in a post-bop/expressionistic 60 's idiom they play seven good Paulsberg originals as if both life and paycheck was on stake at a hole-in-the-wall-jazzclub. And they do it so stylistically confident, aggressive and with such a well composed band authority that an old coltrane-heart strikes double beats of pure joy. The fact that all four are busy in many other musical endeavors will hopefully not prevent the quartet from growing further, in whichever direction composer and conceptmaker Paulsberg has staked out for it.